We’ve pulled together some highlights of the Blended Retirement System to help you understand what’s different, as well as define the significance of the BRS military retirement changes. None of this is financial advice. It's just meant to be informative. One major flaw with the prior military retirement plan (sometimes referred to as the Legacy Plan) was that if you leave the military before you’ve hit 20 years of service, you leave with nothing in military retirement benefits, aside from your own personal savings. To many service members, this is a huge drawback. While armed forces personnel are enabled to open a Thrift Savings Plan (TSP), a retirement savings and investment plan specifically for Federal employees, a recent study shows that only 45 percent have even opened a TSP, and there is no type of government match compensation even if they do have an account. All of that is about to change. Based on the new Blended Retirement System (BRS) plan, unless a service member leaves the military before completing a mere two years of service, they will absolutely leave with some sort of military retirement benefits. Strategists believe the BRS will t will provide benefits to about 85 percent of service members. How much compensation a member receives will depend on many factors, explained below, but the biggest takeaway here is that any military members who started their service in 2018 will be almost guaranteed to walked away with some form of retirement benefits. Due to the nature of the changes in the military retirement plan, the BRS policy change will not benefit everyone currently serving in the military. The military has decided to create an “opt-in” implementation strategy, which works like a 3-tiered system, to make the transition to the blended retirement system as smooth as possible. These members will have a choice either to stay with the current retirement plan OR to enroll in the new Blended Retirement System (BRS). These members will be automatically enrolled into the BRS. Clearly, the most complex tier is the second one – with the option to either stay in Legacy plan or switch to the blended retirement system. Tier 2 service members had until the end of 2018 to opt in to BRS or do nothing; staying in the Legacy program automatically. It’s important for service members to truly weigh the pros and cons of each retirement plan before making a decision to stay in the Legacy plan or opt in to the new BRS plan, for many reasons. One way to analyze the situation is to assess which policy they are closest to by date of service start and jump to whichever plan that falls near. 3. What Are the Changes in Pension Between the Legacy vs. BRS Plan? Unfortunately, under the BRS plan, the full amount of the pension that service members will receive at retirement is going to be cut by 20% over the long run. Yes, you read that right. Currently, the multiplier that is used to calculate the pension is 2.5; under the new plan, it’s reduced to 2.0, resulting in a 20% cut in pay. The Blended Retirement System allows the government to bring a two-pronged approach to military retirement benefits that in no way shape or form currently exist in the Legacy plan. First, the government will begin contributing an automatic 1% of a service member’s base pay into their TSP account. No matter what the service member does beyond that to maximize this money, they will be guaranteed an automatic 1%. Second, the government will also implement a TSP matching program. For every dollar up to 3% of the service member’s pay that they contribute, the military will contribute a dollar. For every dollar past that 3% and up to 5% that the service member contributes, the military will contribute 50 cents. So, for example, if you contribute 1% of your pay, they will match that as a 1% contribution; plus the original automatic 1%, and you will have a new total of 3% of your base pay in the TSP. Savvy military members can do well under the new retirement program - download our guide to get all the intel you need to succeed. While the matching changes are exciting, we want to bring your attention to a few of the regulations associated with the new military benefits program, as well as a few of the risks. First, it’s important to note that the automatic 1% will not be vested (legally entitled) to the military member until they have served for at least 60 days, or two months. Not a big deal, though. The real kicker is that the military member is not fully vested for matching eligibility until the completion of two years of service. Aside from that, anytime the service member chooses to leave, they will get to take 100% of the money that is in their TSP. This has huge implications for service members who know they are not going to serve the full 20 years! There are also two specific risks to be made aware of in regards to the TSP money as it serves to contribute toward retirement. Opening up a Roth IRA within the TSP could be a good idea for tax-free withdrawals at age 59½; not getting overly concerned by the general market swings can also keep investments stable over time. It’s also important to realize that while service members are going to have to pay careful attention to what the money in their TSP is doing over the years, it’s equally crucial to consider what should be done with it at the 20-year mark. The TSP money could easily continue to grow and cushion that 20% cut, or it could be taken out and used to buy a car or a vacation or something that will be gone in an instant. 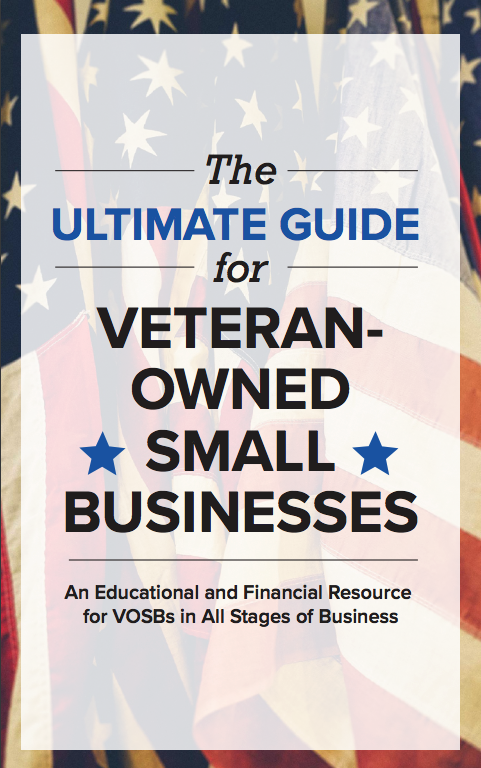 Learn about a new way to invest your money, earn 5% interest AND help veteran small businesses. Another new aspect to the BRS plan that does not have an equivalent in the current Legacy plan is the Lump Sum Retirement option. 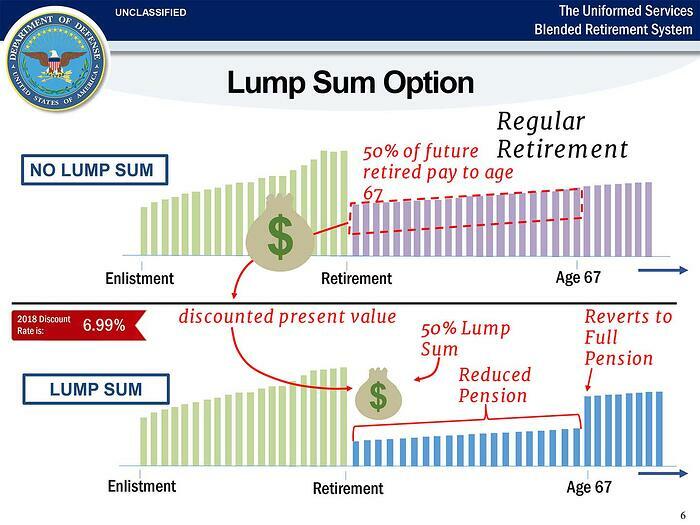 The beauty of the Lump Sum benefit is that it gives the service member some choices when they reach the 20-year mark. Essentially, a service member has the option to collect a discounted portion of their retirement in a lump sum as they hit retirement age. The member can choose to elect for either 25% or 50% of the discounted retirement pay until they reach the full Social Security retirement age (age 67); at that point, their full retirement pay amount will be restored. Understand that since the government is giving all the payments that you would have gotten spread over many years at one time, it is discounted to make up for this spread over time. Therefore, the calculations of the lump sum retirement pay are discounted by 6.99%. This is the final addition of benefits within the BRS plan that is completely new. It’s a bonus used as an incentive to keep military members in service as they reach the midpoint of their careers. Currently, the only incentives that service members have to remain in the military are incremental raises and promotions in rank – with the pension at the end of the tunnel. Under the blended retirement system, military members will be given an option to receive a sum between 2.5x to 13x their monthly base pay; it will be payable beginning at the 8-year service mark, but cannot be paid beyond the 12-year mark. One of the conditions to this bonus is that you may receive it if you agree to serve for four additional years. Clearly, the new Blended Retirement System is a huge change to the military community, and one that will have to be digested and analyzed over time. The onus is on the service member more than ever to be in control of their pension and to make sure they understand what military retirement benefits they are eligible for. The government is trying to save money, but if you are smart and take control, there are many ways to make this new system work to your benefit. There is also an enormous benefit to those individuals who enter the military with no intention of remaining for the full 20 years. 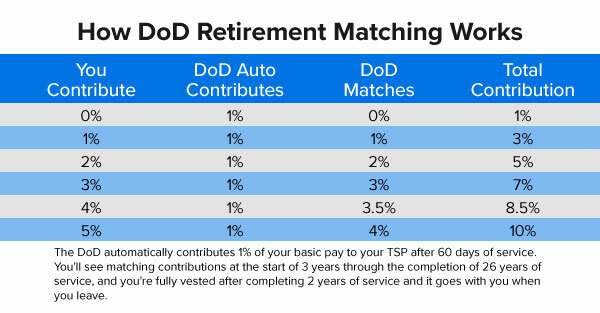 Under this new plan, by maximizing the matching TSP program, they can walk away from the military with greater compensation than has been seen under the current Legacy plan. While there are risks, there are great benefits to be had for those who take the time to capitalize on this potential. 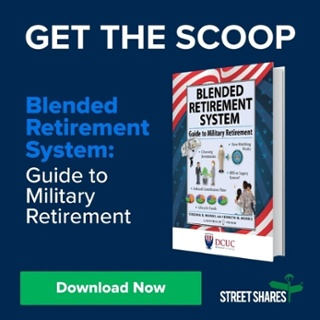 Our partners at DCUC created the “Blended Retirement System: Guide to Military Retirement.” Download it now to get a detailed description of the Blended Retirement System and insights on fundamental retirement planning. StreetShares is not a certified financial advisor and this shouldn't be intended as financial advice. This blog post and downloadable guide is meant to be informative. One should always seek advice from a certified financial planner when planning their retirement goals.